- Six Round Top Arches made of FRP with crystals hanging. So as to accomplish high level of customer trust, we are keenly involved in offering Crystal Wedding Mandap. We offer them at reasonable rates. 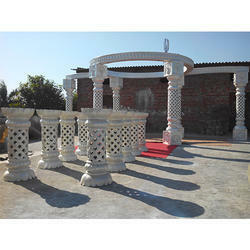 With immense market knowledge, we have been able to provide optimum quality Crystal Wedding Mandap. Our company is engaged in manufacturing and export of all types Indian Wedding Mandaps. The Mandaps are manufactured from FRP Fiberglass material, which is heave duty, light weight, deco painted. Mandaps are very easy to assemble and dissemble. Wedding Mandap includes: Pillars, Arcs, Chairs for Bride & Groom, Chairs for Parents, Havan Kund and Backdrop. We are a unique name in the market to provide our respected customers an exclusive range of Crystal Mandap. In order to meet the altering demands of our clients, our firm has been indulged in providing Crystal Mandaps. This "Crystal Mandap" made out of fine finish Fibre Glass MAterial and coloured accordingly with the desired choice of client, The size of the this Crystal mandap is variable. We manufacture different types of crystal mandap with various designs, also we design crystal mandap as per customer need and requirement. We hold expertise in offering quality approved range of Crystal Mandap. We are offering a wide range of Wedding Fiber Crystal Mandap to our patrons.